Welcome back. Guns are in the news again. As usual, we’re debating what can and should be done. I hope you won’t mind if I repeat my pitch for gun research, not gun control, this time with some big-league help. If perchance you missed my earlier post (Gun Research), I noted that the National Rifle Association, once appreciated by all for gun safety education, marksmanship training and shooting for recreation, didn’t evolve into the gun-rights lobbying organization until the 1970s. Presumably in response to lobbying, Congress removed funding for gun violence research by the Centers for Disease Control and Prevention in 1996 and, in 1997, prohibited the CDC from spending funds “to advocate or promote gun control.” Though not a ban per se, it made it inadvisable for the CDC to fund any gun research. Lest the message be missed, Congress later applied the same funding constraint on the National Institutes of Health. Gun research has continued without federal support; however, the funding and research publications are small fractions of what would be expected based on statistics for other leading causes of death. In that earlier blog post, I gave examples of then recently published studies to indicate what could be learned through research. For this post, I thought the recent study by researchers from the Johns Hopkins Bloomberg School of Public Health would be convincing. 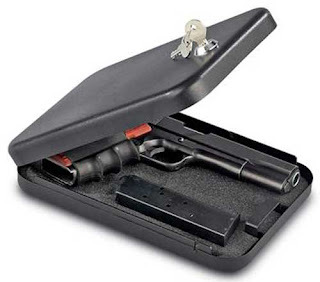 They surveyed 1,444 gun owners in 2016 and found less than half (46%) stored all of their guns safely--in a locked gun safe, cabinet or case; locked into a gun rack; or stored with a trigger lock or other lock. The primary factors driving safe storage were having anyone younger than 18 in the home, owning only handguns, or being influenced by family discussions or a gun safety course. Along with highlighting a safety problem, the study pointed toward a solution. The gun owners ranked law enforcement, hunting or outdoors groups, active-duty military, military veterans and the NRA as most effective in communicating safe-storage practices, with each cited by at least 70% of the survey respondents. While my research pitch won’t be seen beyond my small circle of readers, the RAND Corporation, the nonprofit, nonpartisan think tank, released a report on its two-year Gun Policy in America initiative. 1. What does the scientific evidence say about the effects of various firearm policies on societally important outcomes? 2. What steps might policymakers and other stakeholders take to improve the scientific evidence base on how gun policies affect outcomes? The overriding finding is that the available data support few conclusions. Of the many studies reviewed, only 62 went beyond correlations to laws causing results. The evidence does support the conclusion that safe-storage laws reduce fatal or nonfatal injuries among youth and children. - prohibiting gun purchase or possession by individuals who have a history of involuntary commitment to a psychiatric facility reduces violent crime. Congress should consider lifting restrictions that limit research funding and access to data. The administration should invest in firearm research at the CDC, NIH and National Institute of Justice at levels comparable to its investment in other threats to public safety and health. Government and research sponsors should support research examining the effects of gun laws on a wider set of outcomes, including crime, defensive gun use, hunting and sport shooting, officer-involved shootings and the gun industry. Congress should consider eliminating restrictions it imposed on the use of gun trace data for research. If you’ve interest in the topic, the RAND report should be atop your reading list. Expanding on safe storage, I see value in studying the effects of requiring safety training as some states do. RAND’s look at licensing and permitting requirements was, at best, inconclusive and didn’t appear to address training. If you have ideas for research, pass them to your state and federal representatives. And thanks for stopping by.